Solar power, which is on its way to improving everything from our roads to our smartphones, is vulnerable to the dangers of overheating — a tad troublesome given its source of energy. However, researchers from Stanford University seem to have found a solution: pyramids. While a promising source of renewable energy, today’s solar cells are able to convert about 30 percent of the energy they get from the sun into usable energy. One reason for this inefficient conversion of energy is the overheating of solar cells. In normal operating conditions, solar cells can hit 130 degrees Fahrenheit or higher. Every 1.8-degree Fahrenheit increase in temperature decreases a solar cell’s efficiency by about half a percent, and every 18-degree increase doubles the aging rate of solar cells. A team of researchers led by Shanhui Fan, an electrical engineering professor at Stanford, has come up with a way combat these efficiency and life span issues: They embedded small pyramid- and cone-shaped structures on a thin layer of silica glass to redirect unwelcome heat away from the solar cells. “Our new approach can lower the operating temperature of solar cells passively, improving energy conversion efficiency significantly and increasing the life expectancy of solar cells,” according to Linxiao Zhu, a physicist at Stanford and lead author of the paper about this innovation. The researchers tested two solutions: a flat surface and a surface with pyramid structures and micro-cones. 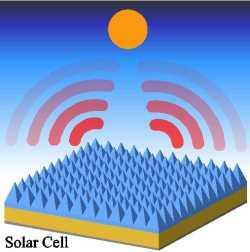 They found that the textured surface outperformed the solar absorption of the flat surface while maintaining nearly the same level of temperature control.